The story of The Baneberry Disaster begins in 1971 and features a 25-year search for justice. Attention history, mystery and atomic energy buffs. You might want to check out a book, The Baneberry Disaster. It’s the story of the Baneberry underground nuclear test whose radioactive cloud escaped from underground and exposed 86 Nevada-test-site workers to radiation, two of whom died of Leukemia. The book is written by Las Vegas attorneys Larry C. and Alan R. Johns who represented the widows of the men who died. Published in August of last year by the University of Nevada Press, the book, a paperback, is part of its Wilbur S. Shepperson Series on Nevada History. I learned about this book when I met one of the authors at a local writers meeting. I tend to want to check out other peoples’ work, especially true stories, and after initially forgetting the name of the book, asking again for the name, ordering and not receiving the book and finally being given a copy, I started reading. Though I have lived through the years described in the book (the story begins in 1971), I had no idea about the facts of the story. The tale unfolds like a mystery with the Johns brothers the detectives. In addition, the story is also a valuable history lesson with photos to illustrate. Young attorneys in Las Vegas when the story began, the authors take the readers along as they hear about the effects of this one particular atomic test. They spend decades attempting to find justice for their clients. Speaking of notes. This book is so detailed and covers such a long time period that the authors must have had reams of files and notes to go through. Conversations are recalled. Testimony is given in detail. Details relating to the physical reactions to atomic testing fallout are amply provided (making one very unlikely to want atomic testing to resume..anywhere). The book is a script for a movie as well, but the bad guys will not look good in the end. The Baneberry Disaster has my five stars. 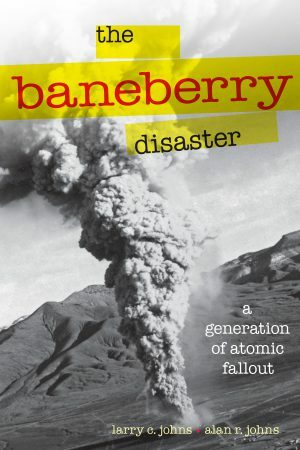 The Baneberry Disaster: A Generation of Atomic Fallout, by Larry C. Johns and Alan R. Johns. Also available as an e-book. 224 pages. Thanks for the review, a book I would definitely read. It is on my list.